Please join us for a truly wonderful art exhibit that supports blooming artists AND local non-profits. Our 4th Annual Young Voices exhibit is open from Friday Feb 15 through March 16th. -- Browse exquisite art works by 7 young artists, and choose a piece of affordable, framed, contemporary, ready-to-hang art for your home. 75% of all sales go to local charities selected by the young artists themselves. What’s not to love about their generosity and drive?! 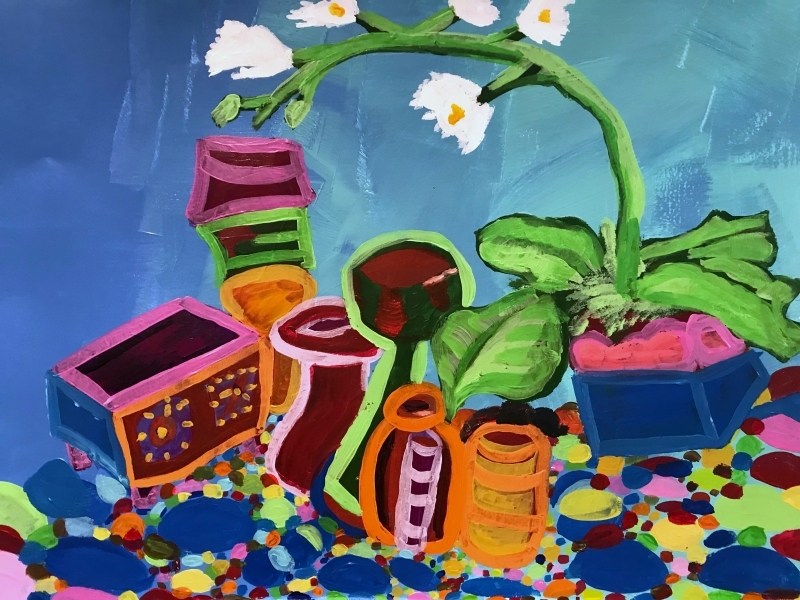 During the fall and winter of 2018 and this year, these students have worked with Maureen Shaughnessy, exploring various printmaking and painting methods as well as considering what is their purpose in making art. Now, the gallery walls are theirs for the duration of the show which runs from February 15th- March 16th. 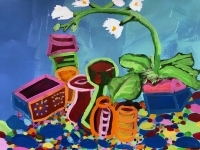 In preparation for this exhibit, the seven students help to mount the show themselves; they choose, frame, sign and title their pieces; help clean and paint the gallery walls and pedestals, write artist statements and gallery talks and, in return, gain generosity, life skills and confidence as young artists and entrepreneurs. Artists featured are: Ema Terry, Rachel Kuntz, Hannah Fleischmann, Adia Terry, Lilly Hamper, Evey Linden and Cianna Williams. These artists range in age from 9-16 years old. The younger students attend studio art sessions on Sundays and the teens have their own independent studio time on Monday afternoons and any day of the week they want to show up. Maureen's students chose two non-profits by consensus, to receive their donations. God's Love and the Holter's Teen Art for Survival program. Young Voices 2019 runs through March 16th and we always have complimentary tea and cookies. At the reception we will have beverages and goodies planned by the students. Please come celebrate with us and support these two deserving local non-profits.